When you’re shopping for a costume, use caution. Before your kids try a hat, mask, wig, or hooded costume, check the item for lice. Just take a peek and be sure you don’t see any little dark dots or moving critters! If you do, notify the store right away so they can eliminate the problem. If you’re really worried about lice in a must-have costume, bring it home and isolate it for a couple of days. Lice can only live without a host person for a day or so. Give potential lice time to die before wearing the the costume. Discourage your children from swapping hats, masks, wigs, or hoods when trick or treating or at a party. The surest way to avoid lice is to stay in your own costume. If you learn that your children have been trying on other kids’ hats, masks, or wigs, comb through their scalps to search for lice when they get home. The earlier you find the problem, the quicker you can get rid of it! Don’t be upset, though, if your kid does come home from a Halloween party with head lice. It’s a common occurrence this time of year. Just come see us. 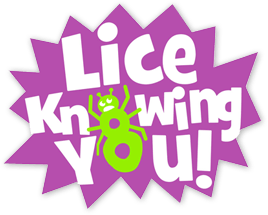 Lice Knowing You is the most trusted and doctor-recommended lice remover in the Western USA. We’ll take those Halloween creepies away!